Freedom did not come easy to India. It took the enormous courage, perseverance and endurance of some great personalities of India who were born to be true patriots. Read about these great Indian patriots who fought tirelessly for the independence of their nation and cared little for their own lives and comforts to achieve their goal. If you like reading about the Great Indian Patriots, click here and forward this article to all your friends and dear ones. Have an august 15th August celebration. Read the brief accounts on the lives of some of the greatest Indian patriots. We plan to add the biographies of more of these special personalities soon. Keep reading! Mohandas Karamchand Gandhi was born in October 2, 1869 in a middle class merchant(Bania/Vaishya) family at Porbandar in Kathiawar, Gujarat. His father was Karamchand Gandhi, a Dewan or Prime Minister of Porbandar. His mother, Putlibai, was a woman of a very pious nature. It was his mother whose peronality and life influenced Gandhiji. She taught Gandhiji to speak the truth in every sphere of life. After finishing high school, Gandhiji joined the Samaldas College in Bhavnagar. When his father died in 1885, he was only 18. It was then that someone advised Ganhiji that he should go to England and come back with a law degree if he was to improve his chance of getting his father's position in the state service in Porbandar. In 1891, he came back to India armed with the degree he set out to achieve in England. After an unsuccesful attempt to set up his own legal practice, Gandhiji received an offer from Dada Abdulla & Co. and set sail for South Africa on behalf of the company for a legal matter. It was in south Africa that Gandhiji became what he was destined to be. Deeply disturbed by the appalling treatment meted out to Indians by the Britishers, Gandhiji decided to fight the discrimination against Indians. He started to practice the ideals of Ahimsa (non-violence), Brahmacharya (continence) and Satyagraha (fasting for a truthful cause). In 1914, his struggle was rewarded when the South African Government entered into an agreement with him and the main demands of the Indians were granted. This success inspired Gandhiji to do something for his own nation. He came back to India and founded a a place of religious retreat called Satyagraha Ashram in Ahmedabad. His first movement in India was in Champaran, Bihar, where he voiced the grievances of the many exploited poor peasants of that area. This compelled the British Government in India to set up a inquiry to gauge the state of the farmers and work for their betterment. The success in this campaign greatly increased Gandhiji's stature in the eyes of millions of exploited. neglected and impoverished Indians. soon Gandhiji began to be known as the "Mahatma" for his great ideals and his adherence to them as well as for his untiring campaign against the British. In 1921, Gandhji called his countrymen to take part in his famous Non-cooperation movement against the British. The movement met with a massive support from the Indian populace but a mob violence during this camapaign in Chauri Chaura shocked Gandhiji to the extent that he called it off. 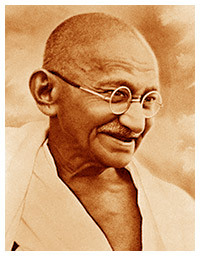 In 1930, he organised the famous "Dandi March" to oppose the British law that deprived Indians to make their own salt. It led to the historic "Civil Disobedience Movement" that saw thousands of Indian men and women defying the British Goverment and being put to jail. In 1942, Gandhiji gave the call for the historic "Quit India Movement" to indicate that the time of the Britishers was up and they should leave India and the Indians for good. The great leader was repeatedly thrown into prison for his protests but it could not break his will. He also worked untiringly to unite Hindud and Muslims, abolish several superstitions and better the hygiene of the poor people in different regions of the country. The drained resources of the British following the Second World War and the rising discontent of Indians prompted the Britisg Government to give India back to her own sons. On 15th August, 1947, India was declared to be an independent nation but not before it was split up into two nations, India and Pakistan. Some Hindu fundamentalists felt that the Mahatma shirked his responsibility in stopping this division. One of them, Nathuram Godse, shot him dead when Gandhiji was going for his evening prayers. The last words on his lips were "Hey Ram". Subhas Chandra Bose was born in a well-to-do Bengali family of Cuttack, Orissa, on January 23, 1897. He was the ninth child of his advocate father Janakinath Bose and mother Prabhavati Devi. The upright character of both of his parents had a profound impact on the mental make-up of Bose. A brilliant student, Bose completed his intial studies at a missionary English school in Cuttack and then at the Ravenshaw Collegiate School there. It was his close contact with the headmaster at the latter institution that filled him the idea of a free India. In 1911, he topped the matriculation examination of Calcutta province and in 1918, passed with a B.A. degree in Philosophy from the Scottish Church College of the University of Calcutta. On his father's persuasion, Bose went to England to appear in the Indian Civil Service (ICS) exams. Though he passed the exams very well and was offered an ICS role, he resigned from it and came back to Calcutta to establish the National College of which he became the principal. But the revolutionary inside Bose ever wanted to express itself and it was his meeting with the great Bengali leader C.R. Das that inspired him to fight for the freedom of the country. Mahatma Gandhi's famous Khadi Movement greatly interested him and he began to sell "khadi" (cloth made of homespun cotton) on the streets of Calcutta, an action that was seen as anti-government and landed him in prison. He continued to work with the Congress along with the Mahatma but the ideals of the latter slowly disillusioned him and the condescending attitude of the Britishers towards the Congressmen frustrated him and made him realize that only an organized armed struggle could overthrow the British Government. He joined the National Volunteer Corps and later was appointed as its Commander-in-Chief. He also launched his own party, the All India Forward Bloc. 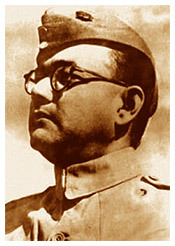 At the outbreak of the Second World War, Netaji (as Subhas Bose began to be called by his countrymen) undertook a perilous journey by submarine and landed in Germany where he met up with Hitler and other Italian and Japanese leaders to seek their assistance in his fight for India's freedom. He was ably supported. The great leader waged a war against the British Government in India. His own outfit, the Indian National Army (INA), fought bravely against the allied forces in Burma and eastern front of India. Netaji's army captured several key posts and would have made inroads to India but the monsoon crushed his plans. Lack of training, inability to cope with the rain in the hills, inadequate ration supplies by Japanese forces and many other factors forced the INA to retreat. Officially, Bose died in a plane crash over Taiwan, while flying to Tokyo on 18 August 1945. But the remains of his body was never recovered which prompted the British Government to set up a commission to investigate his death. The Inquiry Commission under Justice Mukherjee obtained clear information from the Taiwanese Government that no plane crash was reported on the said date and it also made it clear that the reported ashes of Netaji at the Renkoji temple is not his. His mysterious disappearance further adds to the enigma that Netaji was in his lifetime and the search for the great patriot is still on.